My wife and I recently agreed to put some of our savings into the 510, in order to get it on the road faster. Works for me! Until this point, the 510 was solely funded by my welding projects, which also funded all of my other projects. By dedicating some savings towards the 510, I don't have to pull pennies to put the 510 together -- I can actually throw some money into the project and make some progress. First things first -- safety. I stopped by Cut-Rate auto and grabbed a battery box and a set of air cleaners that I figured would need to be modified to make fit. 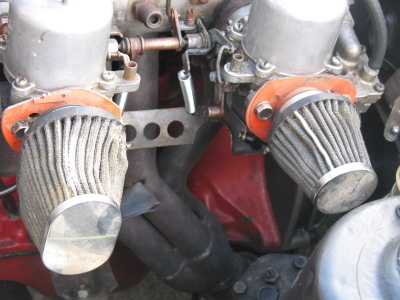 However, after I got home, I actually found a set of air cleaner mounting pieces that were made for the SU carbs. Excellent. 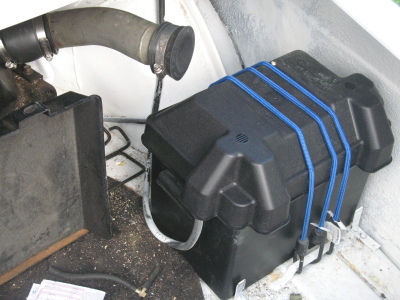 The battery box is still held down with bungee cords, but since the box itself is larger than the battery, it actually fits better in the spot designated for it, and since the box has a lid, I don't have to worry too much about that filler tube visible in the picture. The air cleaners should probably be cleaned, but they work just fine for now. Having a proper set of cleaners (instead of having the carbs sucking straight air from the engine bay) makes me feel much more comfortable about driving the car around. No more worrying about getting rocks sucked into the head!